I’d flown in for her second last Christmas. Mum had told her friends she wanted Christmas Day just with me and they had helped her arrange things so it could be that way. I was deeply moved. I arrived prepared for a long hot day but the weather played its tricks and it was to be a cold gusty wet day. Regardless, it was a special day. I flew home a few days later, before New Year’s Eve. A month later on a strong prompting I flew back. That was to be the end. The Final Act: caring for my mother. Let me tell you about the beginning. Mum and I had had a difficult life together. She wanted to keep me safe, while I fought her control. I wanted to be free, to roam to do, she held the secrets that breed her fears. We battled through the decades. Always a loving truce when I was sick. On the flight East I found myself pondering what might happen if I treated my mother like I treated all the older ladies I knew at church. After the flight I caught the bus to the city then the train for an hour ride south. I was quite tired. Mum met me at the station and I greeted her with a cautious weary hug. From that moment I thought first of her and her needs. That was the Thursday. I rested Friday but made her breakfast, lunch and we went out for dinner. Saturday I drove her into the local Village as she called it. I carried her shopping. Helped with all I could. I did the washing, hung it out, bought it in, folded it according to her instructions. I dusted, and piled the newspapers neatly. I put her feet up while we discussed what we would be doing on ‘Mothers Day’. We planned a relaxed day with a special lunch of her favourite foods. I planned and organised myself for her to have breakfast in bed. Mid morning of Mothers Day I was in the kitchen and my mother walked in. She came close and put her arms around me. Shorter than me, she rested her head in my shoulder. I thought she was never letting go. Figuratively speaking she never did. She then produced a package. A surprise from my daughter. 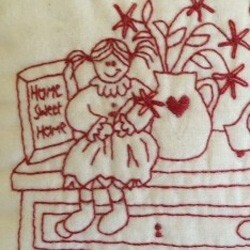 In the parcel was a cross stitch panel for me. This would eventually become a cute cushion. 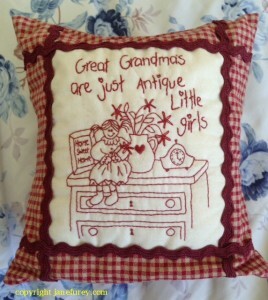 There was also a small complete and filled cushion for my mother. She hugged it tight as her crinkled eyes glistened with tears. I was surprised. But said nothing. Settled at an outdoor table we rang my daughter. I listened to my mother say she couldn’t love the gift more if it was a diamond ring. OK, now I was amazed. Over the next days and weeks there was much more to be amazed about. It seems that when I changed, as per my thoughts on the plane, mum changed too. For 5 years we basked in that special relationship. In true mother daughter closeness. I flew up and down amassing quite the collection of frequent flyer points. I rang 3 times a day when at home. We talked through everything. Agreeing to lay no blame, we found what had caused the problem. After she shared the secrets which pertained to my childhood and now life-long health issues, we discovered we had been wrenched apart by a hospital system that excluded parents, mothers from being anywhere near their sick babies, toddlers and children. Five years later. The last five weeks. We had a day out then a day home. 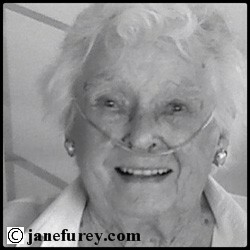 On the day home while she physically rested mum would teach me what-so-ever she thought I might need in the future. ‘Get your note book’ she would call before quickly replacing her mask. I wrote down recipes and instructions. Some things I wondered at but I wrote diligently. Most of them I have used. When she napped I would get online and catch up with friends, especially in a writers group. Later when she woke I would read the messages to her from these women she had never met. They were most supportive of us through this time. I turned back and let myself in. She looked up from her newspaper. I went to her side and kissed her cheek. ‘I love you’ I said. Squeezed her hand and set off again. We did the last haircut. Went out for the last lunch with her girlfriends – women she had known for years, from work from her political life and painting class. We had figured out the portable gas cylinder and a little trolley to pull it on. As she struggled for breath I distracted the friends with cheery news of what we had been up to. Easter Friday was her final day at home. She was noticeably slow in getting going. Mid morning she asked me to assist her to have a shower. But first she directed me to which clothes she would wear. Aqua pants and a matching t-shirt. And a crisp white shirt open over the top. The coordinated earrings and soft white sox since we would be at home. I got the shower running then left her to it – call me if you need. Fairly soon she did indeed call. Wrapped in a towel she sat breathless on the shower stool. I gently dried her off. She was trying to speak but struggling for air. Quickly I grabbed the mask attached to Darth Vader and she breathed easier. I waited. ‘Dry between my toes’ she whispered. Hmm, now feet are not my favourite things. I knelt beside my small frail fragile mother and gently dried between her toes. That night she went in an ambulance to hospital. I knew she would not come back. She requested no visitors. No-one was to come. Not even me. Dad had chosen to die alone and she wanted it that way too. However at her request I did visit on Saturday afternoon. It was a few weeks before I understand why she had asked the nurse to ring me to come in. She looked even smaller and even more fragile. Her bed was set at angle allowing her to see through the French doors out to a small pretty courtyard. I realise as I write that that she would have requested the bed to be moved. I’m smiling. I held her hand and whispered to her. Her large brown eyes looked anxious. Talking was so hard now. Too hard. I indicated the doors. Leaning in close I said Mum, remember what I told you? It will be like walking through those doors. The need to breathe, the pain, the struggle will drop away as you step through them. She squeezed my hand. Her eyes sparkled. On the other side of the door, I continued, will be dad, your parents, and other people you love. They will embrace you. You will not look back. I will be ok. You’ve taught me well. I love you. Somehow my mother reached her tiny frail arms up around me as she gently hugged me. For the last time. Here on earth. By 2:00AM Sunday she had stepped through those beautiful doors. I later realised that my mother had requested me to visit her so that I could leave her, rather than her leaving me. This had been a tender issue since my baby-days in hospital. This is what we had figured out. She has never left me. I feel her close. I feel her influence. I hear her voice. I read her guidance. I look forward to our next embrace. What Salmon Fishing in the Yemem taught me.